When the chef of a two-star Michelin restaurant concocts a dish that is entirely vegetarian and made in one pot, you should cross off whatever main course is currently on your dinner menu and make that dish instead. That's what happened here. I was scrolling through Food and Wine's website and came across this humble, strange-looking recipe for dirty rice - a New Orleans staple - with absolutely no shellfish, with absolutely no fussing. Adam said it was the best vegetarian meal he'd eaten in a long time. I wanted it to be the best vegetarian meal I'd eaten in a long time. So I scrapped my menu of sun-shaped spinach pie (though, how cool does that pie look?!) and harissa hummus, in favor of David Kinch's eggplant dirty rice. Mistake? Not even a little. It's hard to believe this dish is completely vegan. The flavor comes from the NOLA trinity - onions, celery, and green pepper - and plenty of umami from sou sauce and tomato paste. 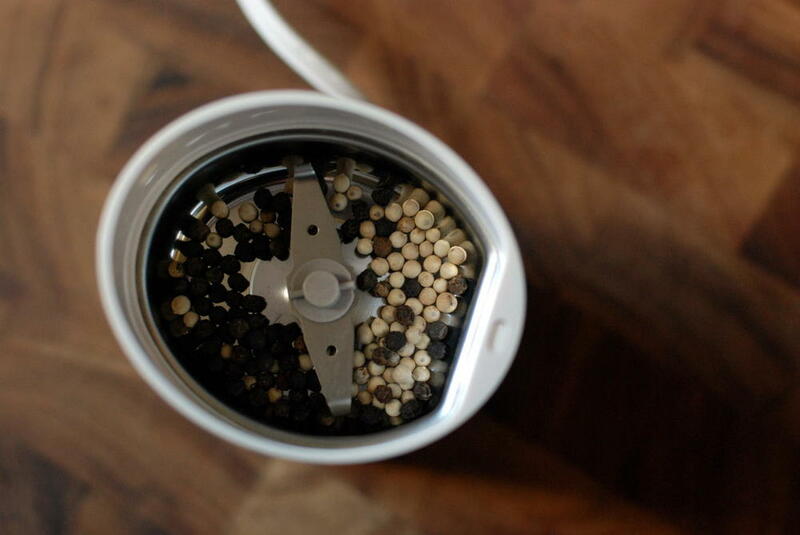 And guys, seriously, the whole thing happens in one big ol' pot. Don't you have to cook the eggplant separately, as one of our guests asked? Why no, you don't. You just pile it all in there. And somewhere between the vegetables sweating and browning and the rice cooking, the eggplant turns into something soft and silky and amazing, all with absolutely no effort. I don't know what else to tell you.....besides you must make this. I thought the meal worked well, and it's nice to have the template recorded for the next time I'm totally lacking inspiration and have to cook. Preheat the oven to 350°. In a large, heavy-bottomed pot (I used a Dutch oven), heat oil over medium heat until it shimmers. Add celery, bell peppers, and onion, and season with about 1/2 teaspoon kosher salt (less if using table salt). Cover pot and cook 5 minutes, until onions have softened. Uncover and cook 10 minutes more, stirring occasionally, until vegetables have browned slightly. Add eggplant, thyme, and all three peppers, along with 1/2 teaspoon more of kosher salt. 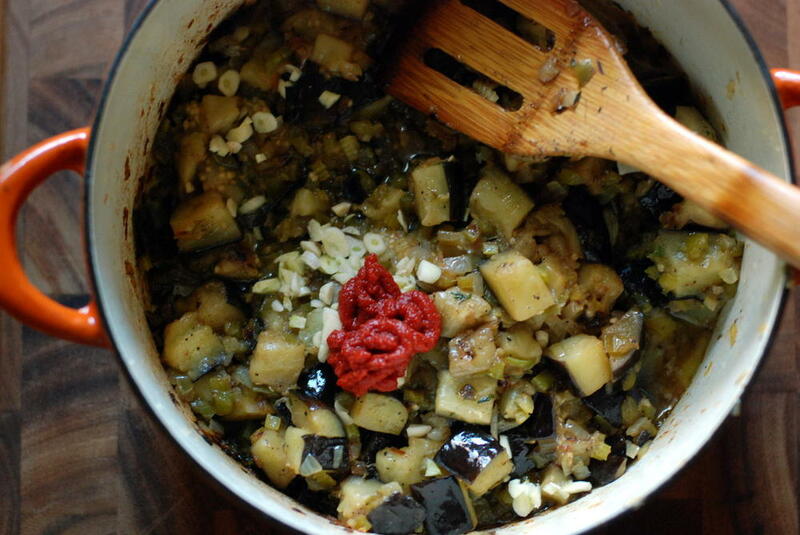 Cook on medium heat for 6-8 minutes, until eggplant has softened considerably but maintains its shape. Add tomato paste and garlic, stir to combine, and cook for 1 minute. Then add soy sauce, rice, and broth, and bring to a boil over high heat. Cover pot, transfer to the oven, and bake for 17 minutes, until the rice is just tender. Remove from the oven and let stand, covered, for 10 minutes. 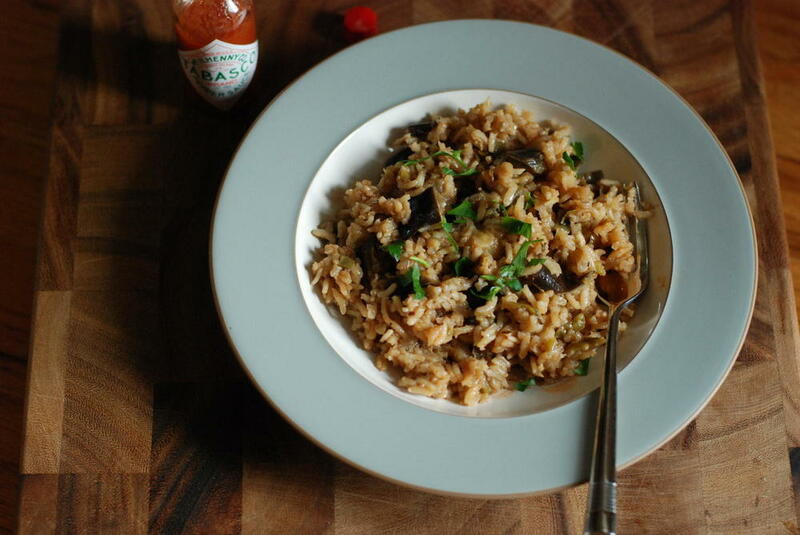 Fluff the rice and serve with hot sauce and chopped parsley.